Our coaching for enrollment/admissions directors accelerates learning and results. Using our proven process for strategic year round enrollment, we'll guide you through professional development, current issues, data analysis, and case studies to grow the quality and effectiveness of your organization. Professional coaching can have a powerful impact because it helps you make wiser decisions, focus on what matters most, build on your strengths, and leverage opportunities for growth. You'll learn what's working in other schools and markets, and develop a path for testing and implementation at your school. 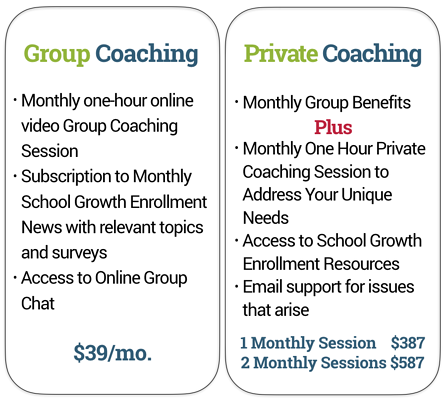 The following Group and Private Coaching options are available. To inquire about Strategic Enrollment Coaching, please complete the form below.